A couple of weeks ago, I took a trip “down the county” with my best friend early on a Saturday morning. Our destination was Mason Beach Fruit Farm, about 45 minutes south of Chincoteague. It was the first time visiting for both of us, but it most definitely won’t be the last. 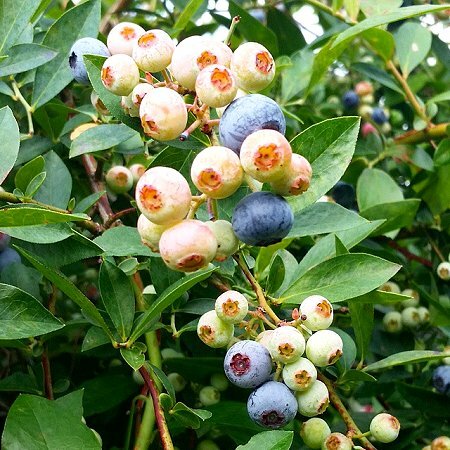 Blueberry bushes 10 feet tall – acres and acres of them. All the bushes I’ve seen in the past have been scrawny little numbers. But these, they literally created shady groves – so the picking was rather pleasant! It’s situated right on the Chesapeake, so cool breezes were plentiful, which also helps. I picked about 10 lbs in just under 2 hours. At $1 per pound, you can’t beat the price with a stick. They also had peaches, plums, and early apples available – all for $1/lb as well. At any rate, I had plenty of fresh blueberries I had to use. What better to do with them than make blueberry flavored booze? 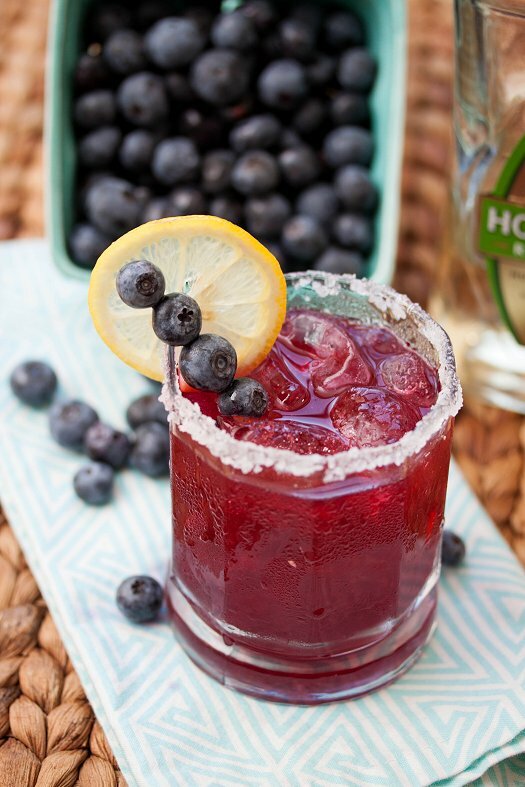 A quick blueberry simple syrup is whipped up, then mixed with traditional margarita components to create this gorgeous cocktail. The flavor of the blueberries really shines through, not to mention the beautiful hue that it leaves the drink with. The syrup is also divine when mixed into lemonade or limeade. But it’s Friday, so tequila is kind of mandatory around here. Enjoy these gorgeous berries while they are in season where you are. I think I’m going to take one more trip down the road to stock up on some berries for the freezer. I hope everyone has a great weekend! For the rim, combine sugar and salt on small plate and set aside. To make the blueberry syrup, combine berries, sugar, and water in a small saucepan. Bring to a boil over medium-high heat. Reduce heat to low and simmer for around 8 minutes, until blueberries have burst. Pour through a fine mesh strainer into a large measuring cup or bowl, pushing on the pulp to remove as much liquid as possible. Let cool then place in an airtight container and refrigerate. Syrup can be kept refrigerated for up to 2 weeks. To make the margaritas, rim the edges of two glasses with a lemon or lime wedge and dip into the salt/sugar mixture. Fill glasses with ice. Combine blueberry syrup, tequila, triple sec, and margarita mixer in a carafe or large mixing glass and stir to combine. Pour into ice-filled glasses. Garnish with lemon and lime wedges, and additional blueberries if desired.